The iPet play pen is the ideal solution for both puppies and adult dogs. Use the playpen for anything from house training to reinforcing house rules and boundaries – or simply as a safe, secure place for your pooch to rest and relax. The sides feature 4mm durable metal-wire construction for strength and optimal ventilation and visibility. Rounded corners promote safety and help protect pets. 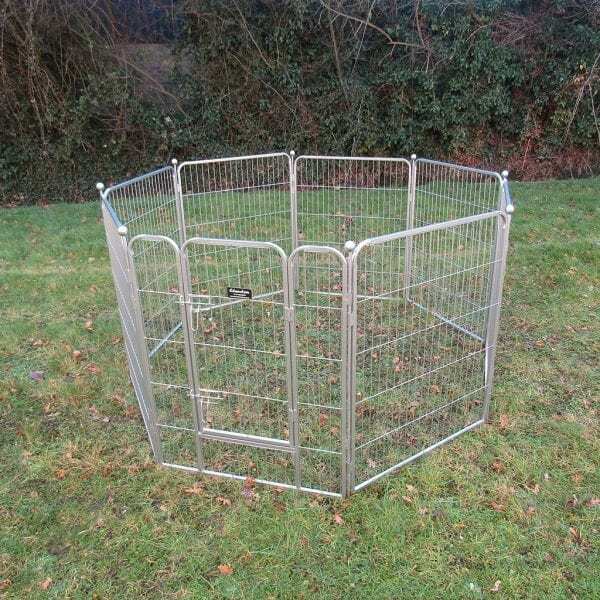 Chameleon heavy duty playpens are made from the highest quality materials with a corrosion resistant silver powder coated finish. The play pen is available as 80cm or 100cm high panels. These outdoor play pens come with either 6 or 8 side panels, and allows you to make a variety of shapes such as squares, rectangles, octagons, hexagons and more.